It’s April and California native bulbs are beginning to bloom in local gardens. 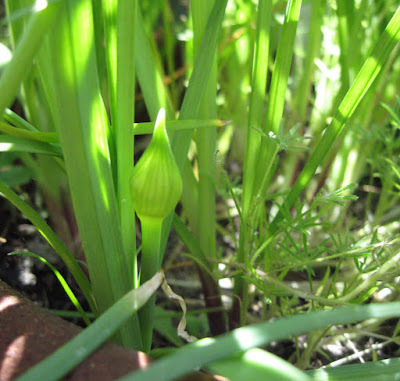 The Meadow onions in Mother Nature’s Backyard have flower buds – about ready to burst into bloom. So we feature this lovely true bulb as our Plant of the Month. The scientific name is pronounced: AL-ee-um yu-nee-FOE-lee-um. 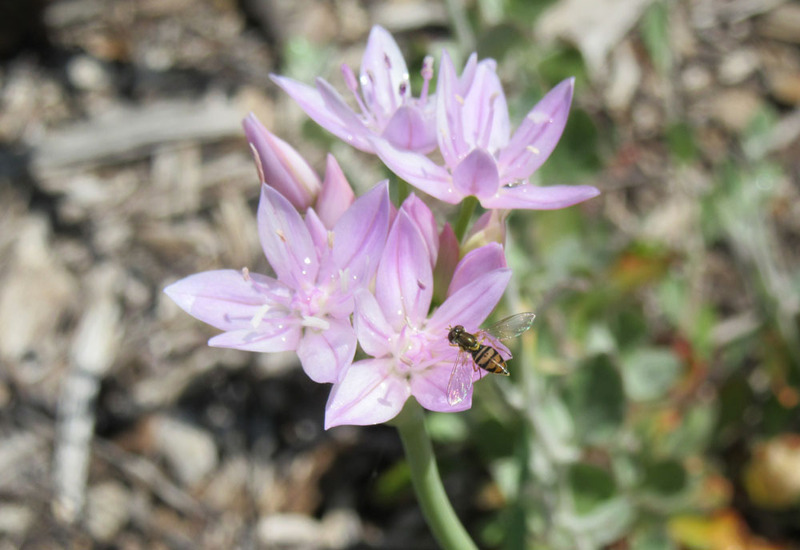 The Meadow onion is not native to Los Angeles County. It grows along the Central and Northern coast of California, from San Luis Obispo County into Oregon. It grows in moist, often grassy areas on coastal cliffs in the coastal pine and mixed evergreen forests. It likes moist soils and is most comfortable in clay. These two preferences make it a good choice for many gardens. 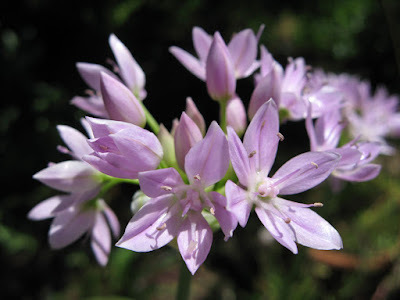 Allium unifolium is an onion (genus Allium), a cousin to our culinary onions and garlic. The onions were formerly included in a large bulb-forming family, the Lilliaceae. Some taxonomists now recommend placing the onions in their own family, the Alliaceae. Others place the onions in the Amaryllis Family (Amaryllidaceae), along with such garden genera as Agapanthus, Amaryllis, Clivia, Narcissis and Zephyranthes. Only time will tell where the Alliums will end up. California has over 45 different species of native onions. The vast majority grow in Northern California or the Sierra Nevada Range. 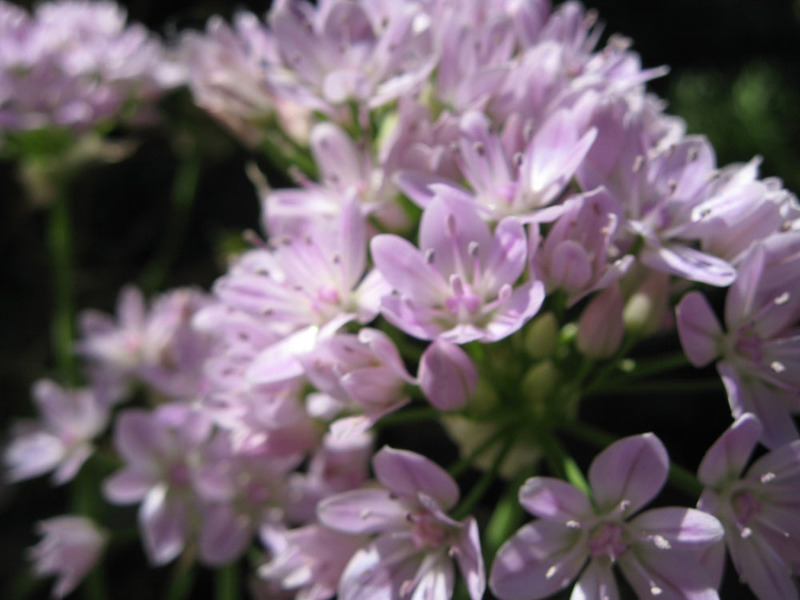 Only 11 are native to Los Angeles County, and only four (Allium dichlamydium, A. haematochiton, A. peninsulare and A. praecox) are to western Los Angeles County or the Southern Channel Islands. Fortunately for S. California gardeners, even the northern species can often succeed in local gardens – if only you can find a source for the bulbs! Like most Alliums, Meadow onion is a fairly simple perennial. 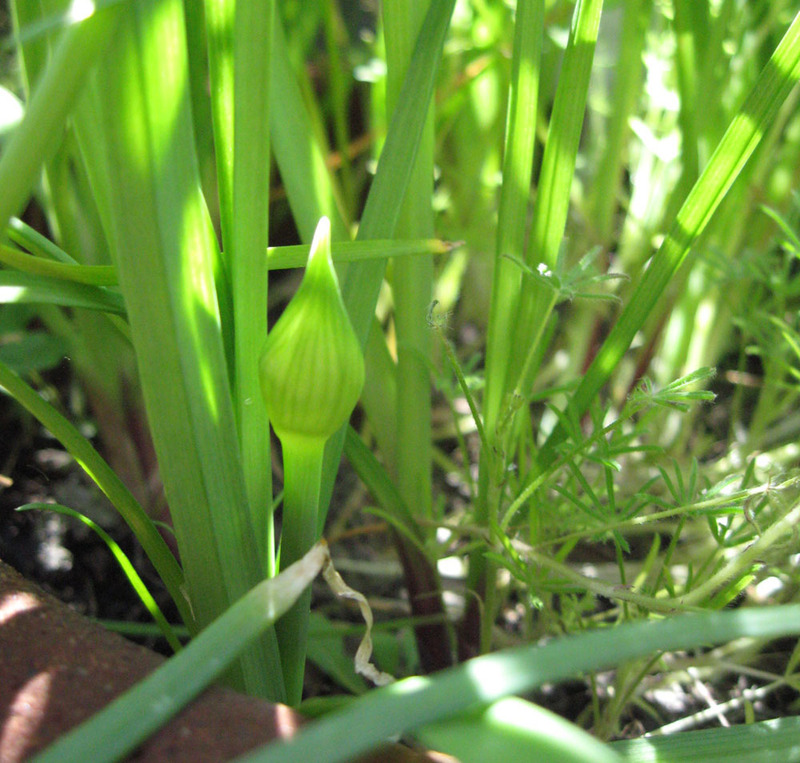 Its leaves emerge from the bulb with the winter rains. We often see them start to emerge in February in our garden. The leaves are the simple, strap-like leaves of the onions. The genus name unifolium mean ‘single-leaf’; in fact, another name for this plant is the One-leaf onion. As seen above, plants are indeed sparsely leaved (one to four leaves is typical). The leaves often start to wither from the tips (and sometimes wither altogether) before the flowers emerge. Meadow onion blooms in spring or early summer: usually April or May locally, but a bit later in colder climates. The flowers grow in dense clusters (umbels) on 1-2 foot (30-45 cm) flowering stalks. 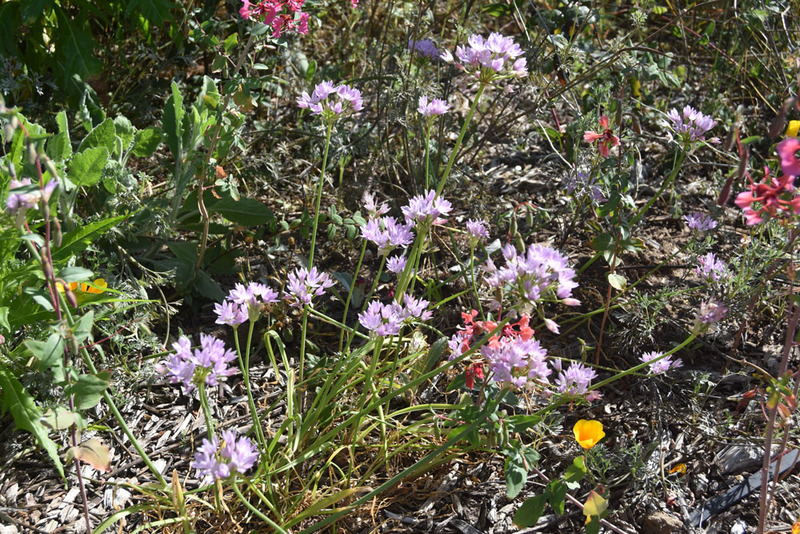 If you live in a dry place like S. California, the flowering stalks may be a little shorter. The buds are tightly packed in a membranous sheath (see above) at the tip of the growing flower stalk. The stalks grow very quickly to their full height. Meadow onion has the star- or bell-shaped flowers typical of the onions. The six veined ‘petals’ are actually tepals (petals and sepals look alike). 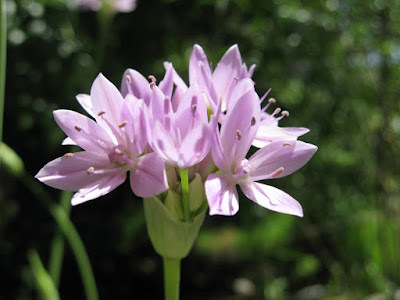 The flowers are individually small (about ½ an inch across), but with 15 or more flowers per umbel, this onion is a showy bloomer. The flower color is most often a pale lavender or pale pink, though white-flowering forms are known. 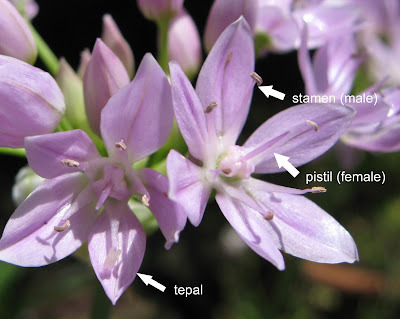 The flowers contain both male and female parts (‘perfect’ flowers). The pollen in this species is either gray or yellow. The plants produce seeds in our garden, so they do attract some insect pollinators with their mildly sweet aroma. While the literature specifies bees as pollinators, we more often see the flower flies (below). 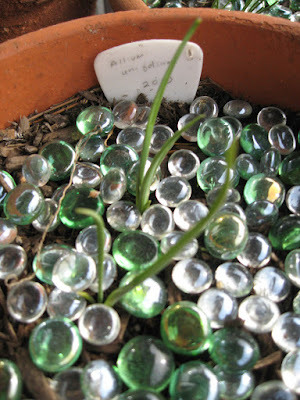 Allium unifolium is easy to grow. 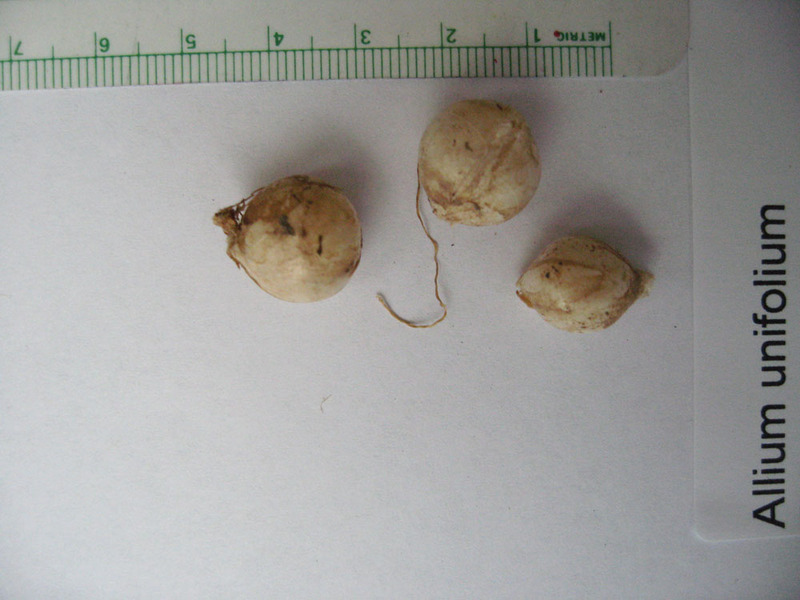 It can be grown in just about any soil, although it prefers the moisture-retaining clays. It needs a neutral to alkali soil (pH 7.0-9.0). While it grows in full sun up north, Southern California gardeners should plant this species in part shade (afternoon shade to fairly shady). This plant does need good winter/early spring rains. We had to supplement ours this dry winter. Unlike some native bulbs, this species can take occasional summer water. We let our plants go to seed, then let them self-seed naturally (or spread them where we want to start a new patch). Patches increase both by seed and by offsets (new little bulbs). A modest investment in bulbs will increase to a nice grouping within 4-5 years. We like to start out by planting 8-10 bulbs within a 2 square foot area. Don’t worry about critters digging up the bulbs – they tend to leave onions alone. We love the flowers of this onion. The color contrasts nicely with native grasses and wildflowers. It’s great for brightening shady areas of the garden, for example, under trees. The plants naturalize nicely, and can help ‘tie together’ parts of the garden with their pastel leaves and flowers. Bulbs are a perfect choice for bordering pathways, as an accent plant in a rock garden or along a garden wall. Meadow onion’s flowers have a light, sweet fragrance, making them a good choice for containers near seating areas and as cut flowers. This bulb would do well around the drier edges of a vegetable garden or in an herb garden. There is some debate about whether this species is edible. Native Californians did not eat it; however, at least one blogger uses the stems as a flavoring agent [ref. 1, below]. 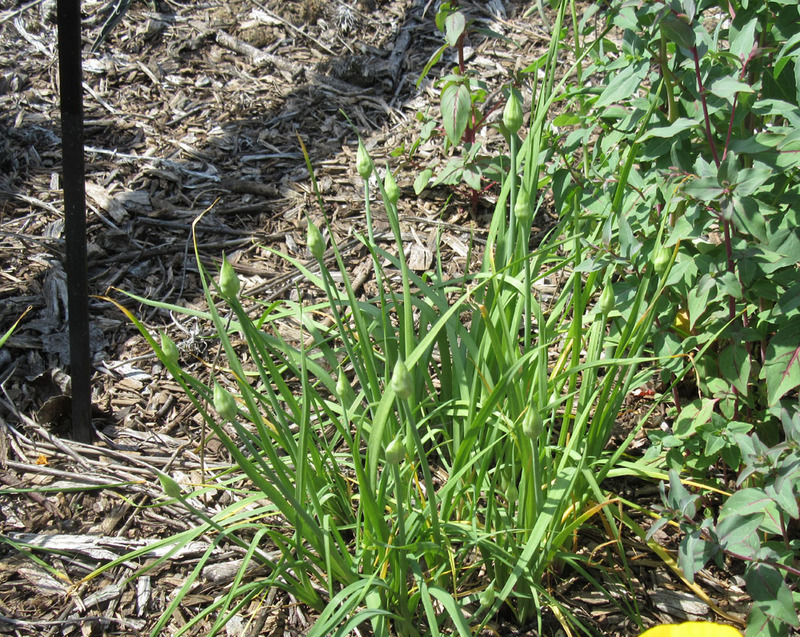 So why include Meadow onion in your garden? First, it’s easy to grow and available from bulb dealers. Second, it’s a little charmer that’s adaptable to garden challenges like clay soil and a bit of shade. Thirdly, it provides an economical solution to providing masses of spring color – or to naturalize. And finally, Meadow onion has all the magic of a native perennial bulb. It gives you something to look forward to, without much care, year after year. It’s a seasonal treat, anticipated and enjoyed, that ties us to the land and its seasons. We echo many previous garden mavens, in singing the praises of garden bulbs. Mine haven't started to bloom yet this year - down here in San Diego...but I do love them. Aren't they wonderful - I look forward to them every year!